Oh goodness, gentle readers, there is so very little storage in our little bathroom! I was so spoiled by the room and shelves in my old apartment (and even more spoiled by the huge linen closet in my previous apartment). What's a girl with too much stuff to do!? Throw it out? Pshaw! I don't think so. While you know your MatchGirl purged a lot prior to the move, there are a few things that a girl just needs to get by. Thankfully the most wonderful store on Earth is only a couple of blocks away from your MatchGirl's office. Yes. That's right. The Container Store! 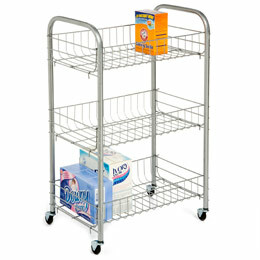 It's amazing how a little cart that only costs $18 can make such a big difference in keeping our bathroom organized.